Home / News / Noctua introduce Chromax su buona parte della sua linea ventole. Noctua introduce Chromax su buona parte della sua linea ventole. Vienna, October 16th 2017 – Noctua today introduced the long-awaited chromax editions of its most renowned 120mm and 140mm fan models as well as chromax line cables and heatsink covers for its award-winning NH-U12S and NH-D15 series CPU coolers. 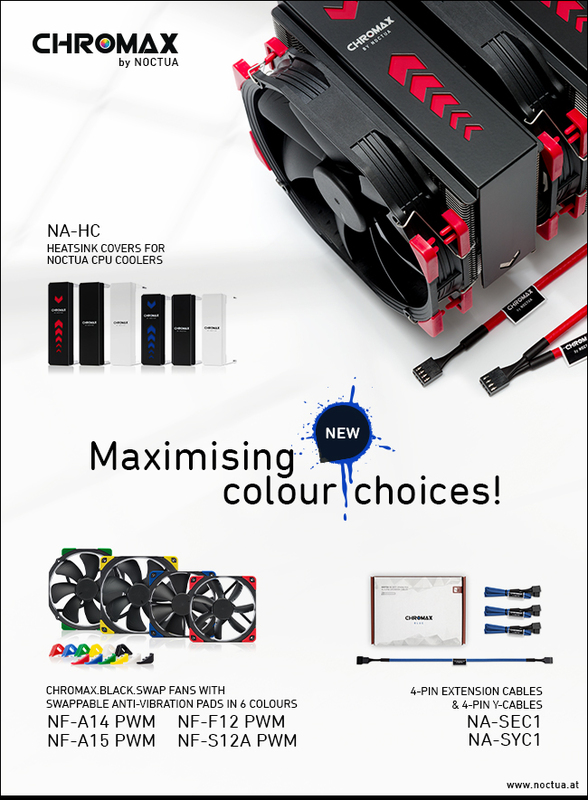 All the new chromax line products allow users to colour-customise their Noctua cooling systems in order to match popular build colour schemes. Having received more than 100 awards and recommendations from international hardware websites and magazines, the NF-A15, NF-A14, NF-F12 and NF-S12A are among Noctua’s most renowned 140mm and 120mm fans. The new chromax.black.swap edition combines their signature quiet cooling performance with an attractive all-black design and a bundle of swappable red, white, blue, green, yellow and black anti-vibration pads that allow the colour-customisation of the fans to match individual build colour schemes. Topped off with Noctua’s trusted premium-grade SSO2 bearing, more than 150,000 hours MTTF and a 6-year manufacturer’s warranty, the new chromax.black.swap fans are the perfect choice for all users who value individual, focused build aesthetics just as much as class-leading quality and performance. Noctua’s new chromax line NA-SEC1 extension cable and NA-SYC1 y-cable sets enable users to take one step further in colour-customising their fans: available with red, blue, green, yellow, black and white sleeving, the cables allow a PC build to be colour-coordinated down to the smallest detail and are an ideal match for the new chromax.black.swap edition fans. While the NA-EC1 30cm extension cables provide extra reach in larger enclosures, the NA-YC1 y-cables make it possible to run two 4-pin PWM fans on a single fan header and to let the motherboard control the speed of both fans simultaneously. The new NA-HC heatsink covers are add-on accessories for Noctua’s award-winning NH-U12S and NH-D15(S) series CPU coolers. Made from high-quality, powder-coated aluminium and available in black (chromax.black), white (chromax.white) and black with swappable inlays in black, white, red, blue, green and yellow (chromax.black.swap), they allow users to colour-customise their coolers in order to coordinate them with popular build colour schemes such as all-black, black and white or black and red. Thanks to the easy, straightforward installation, changing the looks of a Noctua cooler only takes a few minutes and doesn’t even require taking it off the CPU. Combined with the new chromax.black.swap edition fans, the NA-HC covers give users endless possibilities to design their very own, individual Noctua coolers that look just as great as they cool! Designed in Austria, Noctua’s premium cooling components are internationally renowned for their superb quietness, exceptional performance and thoroughgoing quality. 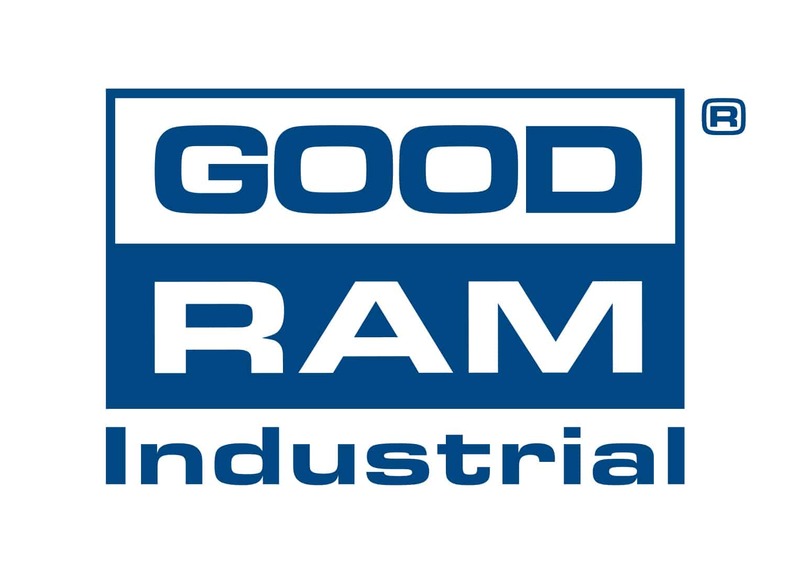 Having received more than 6000 awards and recommendations from leading hardware websites and magazines, Noctua’s fans and heatsinks are serving hundreds of thousands of satisfied customers around the globe. 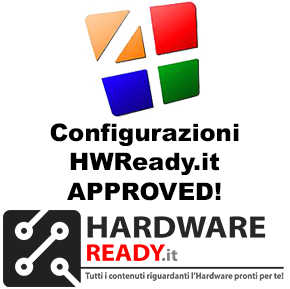 Successivo Tante novità da NZXT con la H-Series.